Stave shells are a unique approach to drum shell manufacturing. There are many benefits to a stave shell construction. Stave shell drums are more commonly used for snare drums, but can be found available in full kit configurations also. What is a stave shell? A stave shell consists of multiple strips of solid lumber cut with the grain, which will yield a vertical grain. The staves, when assembled, will have several vertical seams butted together. The seams are then glued together and the shell is placed under pressure via clamping. Once glue is dried, the shell is turned down to achieve the final round profile. Some builders use a lathe to turn the shell. Others fashion a jig to hold a router or similar machine in order to turn the shell round. Some artisans even turn the shell by hand with sanding techniques. Unlike steam-bent single ply shells and standard multiple ply shells, stave shells are not under tension. Not being under high tension automatically allows the shell to have a lower resonant tone. 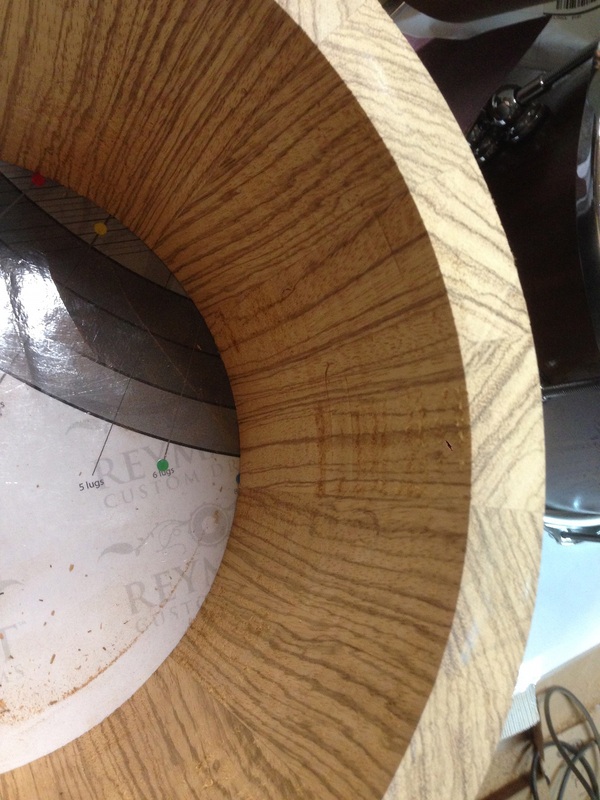 This allows the drum to produce a very pure woody tone. The note is clearer and shorter. The lower tone allows for more power from the drum when more force is applied. Vertical wood grain offers a highly efficient way for the batter head and resonant head to function because of the superior vibration through the shell. Vertical grain also offers the bearing edge more durability due to the hardness of the end grain. A stave shell uses about 1/16th of the amount of glue when compared to a standard ply shell. This feature, along with low shell tension, lets the natural tone of the wood sing. Stave drum builders are unique individuals. The artistry behind the craft is breath-taking. Sometimes you will hear the title ‘Drum Luthier’ or ‘Cooper’. Either term points to the fact that this trade is a highly specialized type of work. For more information, search the term, ‘White Coopering’.